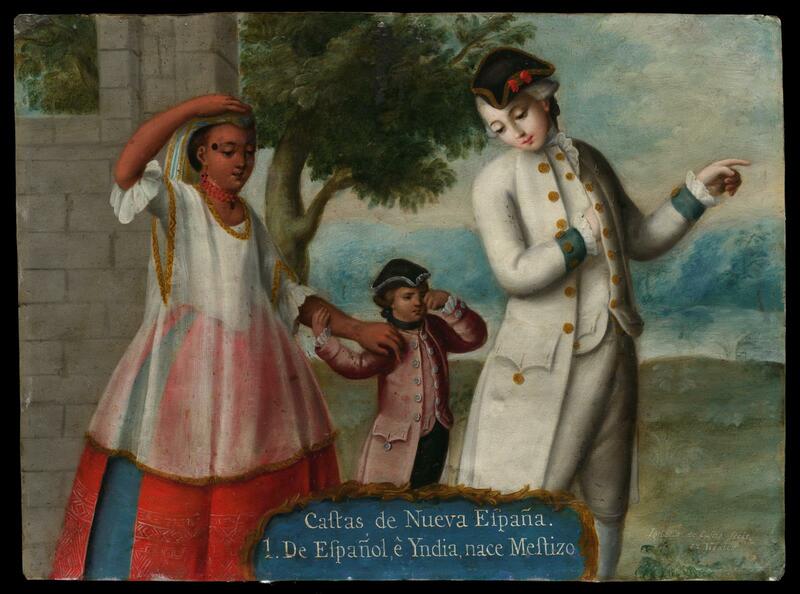 Art from the Spanish colonies illustrates sophisticated multilingual design; hybrid forms combine indigenous materials and techniques with European and Asian styles. 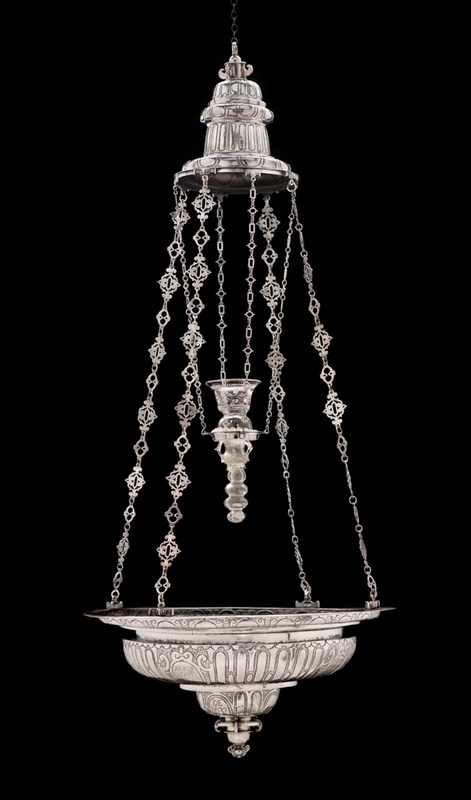 Furniture, paintings, and silver in this collection demonstrate the material wealth of colonial Latin America made possible through global trade. The inventory of Rudolf II’s Kunstkammer, drawn up between 1607 and 1611 lists, on folio 58, nine “gemeld ven federn al Indiana” (feather paintings from the Indies), including No. 615, “Der engel s.t. Michael, under ihm der teuffel” (The angel St. Michael, under him the devil). Based on its similarities to other paintings from this series, which are today in the Kunsthistorisches Museum, Vienna (nos. 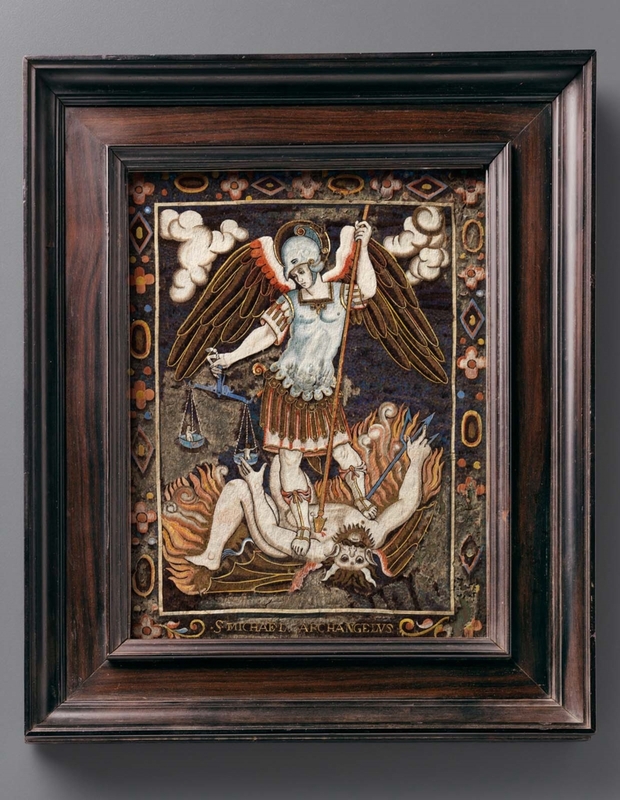 SK GS Kap 321, 322, and 323), and the original frame that surrounds the work, Rudolf II’s Saint Michael is almost certainly the present work. See Rotraud Bauer and Herbert Haupt, eds., Das Kunstkammerinventar Kaiser Rudolfs II., 1607-1611, vol. 72 of Jahrbuch der Kunsthistorischen Sammlungen in Wien, 1976, pp. 34-35. According to information provided by the auction house, the painting was consigned by a “North Country gentleman” who had inherited it from his maternal grandmother, a British citizen who passed away in 1926. She may have acquired the work in France. Overall: h. 12 1/8 w. 10 1.3 in. Painted on the underside of the front bottom rail in script: "de las comodas"
Thought to have been owned originally by Don Fernando Luis Altamirano de Velasco Legazpi y Albornoz, third count of Santiago de Calimaya, who served as alcalde mayor (mayor) of Villa Alta de San Ildefonso in 1671–2. By 1970, private collection, France ; 2007, anonymous (private collection) sale, Thierry de Maigret, Paris, 13 June 2007, lot 154, to Alexander di Carcaci Ltd; 2008, sold by Alexander di Carcaci Ltd, London, to Carlton Hobbs LLC, London; 2010, sold by Carlton Hobbs LLC, New York, to the MFA. Letter from Thierry de Maigret, Paris, 29 January 2010, states that the desk was in France by at least 1970, in the possession of a family residing in the Paris region. 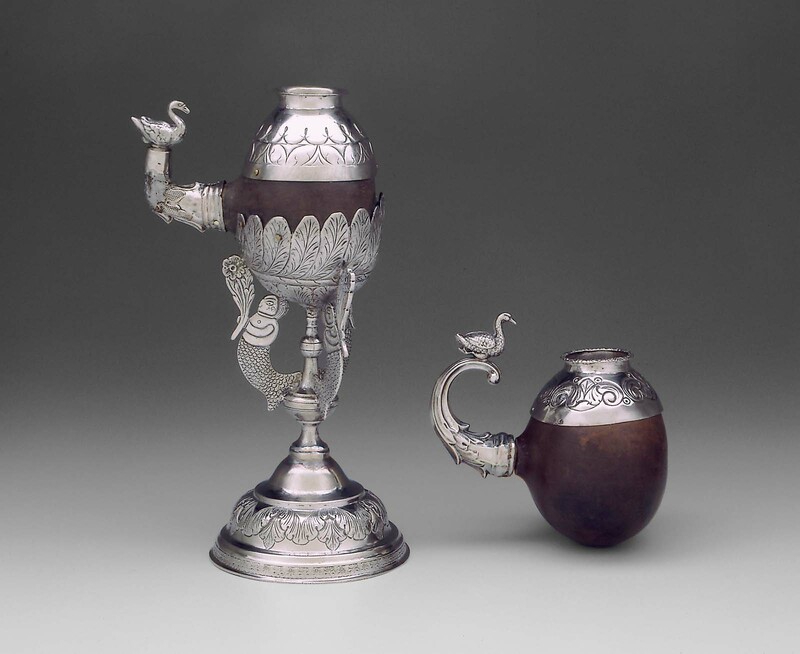 The egg-shaped gourd has a stamped and engraved silver fitting affixed to the upper third of the body. A silver handle, fitted to a fingerlike tendril of the gourd, extends to one side. The cast two-part handle extends upward, in a C shape, toward the rim. Decorated with foliate patterns, the handle terminates in the body of a duck that perches on its tip. The small growth at the side of this bottle gourd, as well as the one in cat. no. 386, was commonly employed as a handle on mate cups. 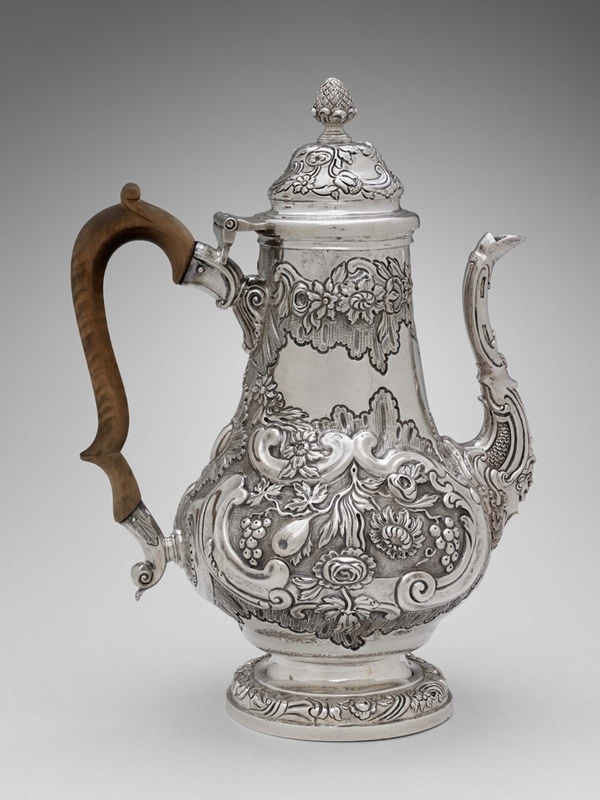 Silver fittings were added to the finer examples. These forms were particularly favored in Uruguay. 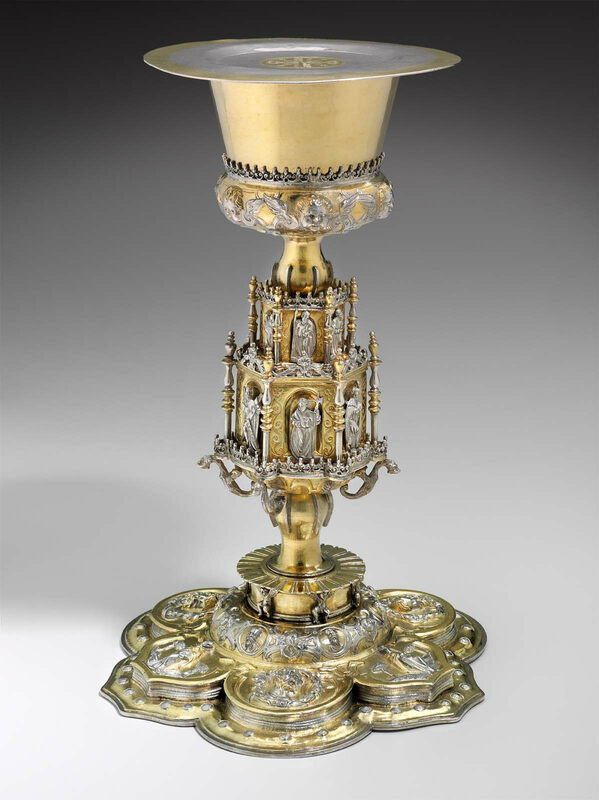 A separate ring-shaped base, now lost but often made of silver, was intended to hold the cups upright when not in use. Collected in Buenos Aires, Argentina, by Mr. and Mrs. Edmund P. Graves between 1898 and 1913. "Ignacio de Castro fecit, en México"
Engraved on well of lamp: "DONA/MADALENA/DE VALDIBI/ESO Y ROX/AS MV" "XER DE/EL CAPIT/AN DON J/DE FRES NE/DA SIR" "ANO" "DE/1637" "VIO CON/ESTA LAN/PARA ANV/ESTRO SE/NOR" "I ASUSA/NTA IMAXEN/ENESTACA/SA DELAVE/RACRZ"
(Doña Magdalena de Valdivieso y Rojas wife of Captain Don J de Fresneda Sir / Saw with this lamp our lord and his sacred image in this House of the True Cross / The year 1637). Overall: 130 x 58 cm (51 3/16 x 22 13/16 in.) Troy weight: 5.5 troy ounces or 12 lbs. Formed of five sheets of silver with a simple replaced wooden framework, the slanted central portion of the stand has been repousséd with an elliptical boss on which is chased the Jesuit seal containing the letters “IHS,” with a cross above and three nails below. 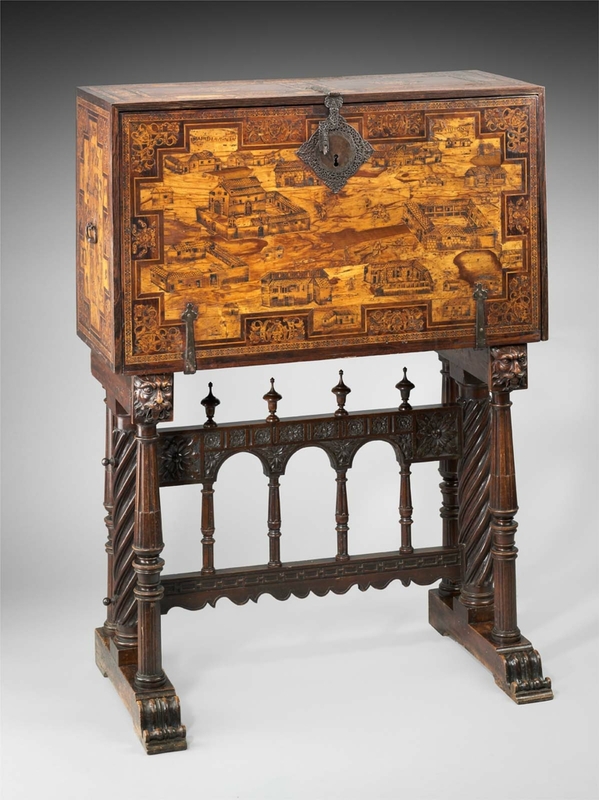 Covered throughout with repousséd and chased decoration, the pattern is bilaterally symmetrical. Passion flowers and vines form the primary subject matter; a pair of “hombre verde,” or green men, flank the Jesuit seal, and a pair of viscachas emerges from the greenery below the seal. An angel-like grotesquerie emerges from a foliate bud located centrally on the lower skirt of the stand. Cast sphinxlike creatures are affixed to the two front corners, and three small floral elements are attached to the stand’s upper edge. 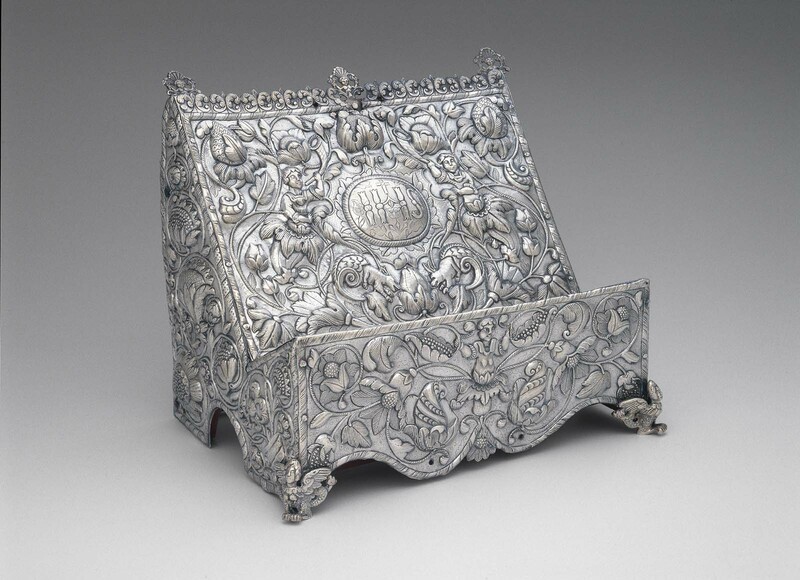 The bold floral and figurative work on this missal stand is similar to that seen in the preceding ornamental plaques. The stand is perhaps most notable for its inclusion of the mountain viscacha, an animal indigenous to South America. A member of the chinchilla family, this small and timid plant-eating rodent with large rabbitlike ears became a popular decorative element in silver and textiles of the postconquest period. The passion flower is depicted as a strawberry-shaped fruit on the side of the stand. The missal stand is intended to support a copy of the liturgical book of the Roman rite that is used by the priest during Mass. The stand would have been placed nearby on the altar so that the officiant could refer to it as needed. Because of its orientation toward the congregation, the missal stand was finished on the front and two sides but left open and unfinished at the back. “IHS” in raised letters chased within an elliptical boss at center of stand. NOTE: According to Alphonse Jax at the time of the sale, this entered the United States from Argentina and was cleared by U.S. Customs on April 7, 1975. 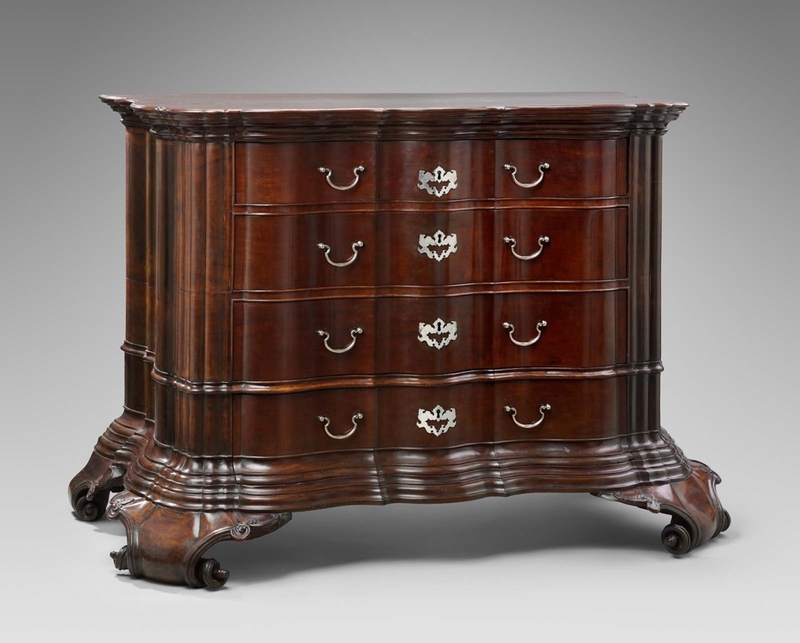 The donor, however, later recalled that he purchased it from the Edward Merrin Gallery, New York.